Keeping Lorikeets as pets is popular with those who enjoy larger birds, and the Rainbow Lorikeet is one of the biggest in this bird family. You should not consider a single bird if you can not provide constant stimulation and companionship, because these pets need to be social throughout the day. Pet parrots have a lot of needs, and they can be expensive to keep, but if you can afford it then many of these birds can make excellent friends. 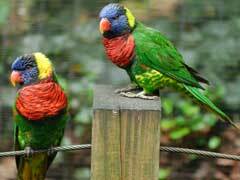 If you are going to keep Lorikeets as pets then you will need to understand their diet, which is different from most parrot species, because Lorikeets will only eat nectar, as well as fresh fruits and vegetables. Commercial Lorikeet food can be purchased at some pet supply stores, but most of these birds will refuse to eat it. Instead you need to provide nectar, either in liquid form or as a high quality dry nectar powder. If you choose the powder the bird will add water, so make sure there is water close by and available at all times. Rainbow Lorikeets as pets may not be ideal if you have small children unless you can provide constant supervision, because these birds may bite if upset or frightened and the large beak can draw blood. This is true of all large exotic pet birds though, and is not specific just to Lorikeets. Having Lorikeets as pets if you have the time, money, and attention to give can be very rewarding. These birds can talk, and are very amusing to watch. They are often referred to as clowns, because they like to exaggerate movements and look comical. The brilliant coloring of these pets can be displayed in large decorative bird cages, and they enjoy being touched and played with. Toys are a must, because these parrots are very curious and will investigate anything. Toys offer mental and physical stimulation, to keep your pet happy and healthy.